When it comes to Palm Springs hotels, you’ll be spoiled for choice, but how do you compare hotels? By reading reviews like this. If you’re wondering where to stay in Palm Springs, here are seven great options. Palm Springs is changing. There have always been plenty of reasons to vacation in this Southern California winter haven: sunshine, spas, hiking, golf, art and mid-century modern architecture. No wonder it was such a draw for Hollywood stars in the 60s. Long popular with retirees, and well known as a gay-friendly destination, this desert hot spot has emerged from its sleepy reputation like an art deco butterfly spreading its Joseph-Adler-designed wings. Today Greater Palm Springs, made up of nine communities altogether, has reached a whole new level of cool with a flock of younger design-centric folk moving in. This means hotels have upped the ante, investing in amenities and service and taking architectural risks. 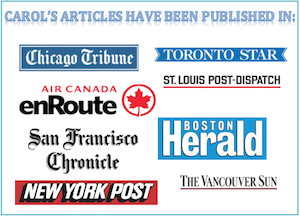 This is good news for you. 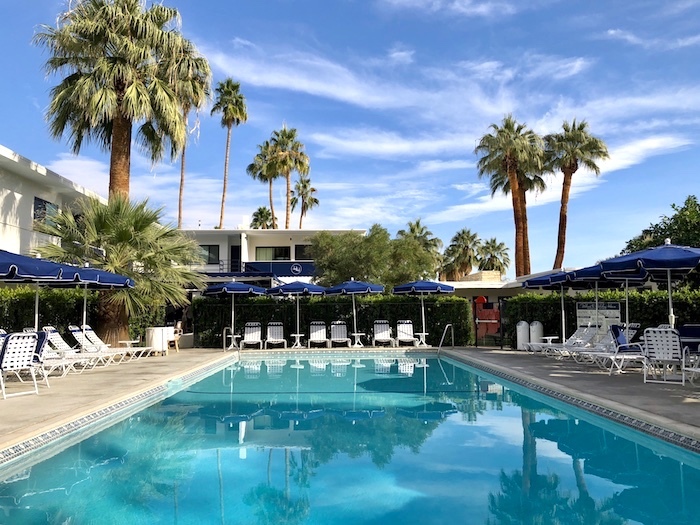 Whether you’re after a traditional luxury resort, an urban mecca of cool, a laidback lair or eclectic flair, here are seven top Palm Springs hotels to choose from. The air was as dry as a sunbaked rock, the sun beat down on the turquoise pool and the Riviera Hotel in Palm Springs was filled with celebrity ghosts. Elvis, Frank Sinatra, Marilyn Monroe: they all lounged poolside here in the 60s, and I couldn’t help wondering what went on when it was the getaway of choice for the Hollywood Rat Pack. Of course I sniffed out as much gossip about this legendary Palm Springs hotel as I could. There are reports of Frank Sinatra throwing champagne bottles at second wife Ava Gardner, and of Marlene Dietrich and Greta Garbo splashing around naked in the pool. From my deck chair under a palm tree I look around eagle-eyed for any signs of Hollywood decadence, but the wildest thing I see is a bikini-clad woman ordering a Cosmo at the Soleil Pool Bar. Nonetheless, the Riviera still feels vibrant and fresh rather than being lost in the past. I chalk this down to the chic-with-pizzaz decor of the lobby, restaurants and intimate sitting areas. Note to lovers of intimate sitting areas. There are so many, each so exquisitely decorated with a mid-century modern flair, it’s a bit like visiting a high-end home show. And, if you’re like me, you will while away many minutes moving from couch to couch just because you can. Built in 1959, the Riviera has a spoke-wheel layout, with six low rise accommodation wings extending out from the main pool area. 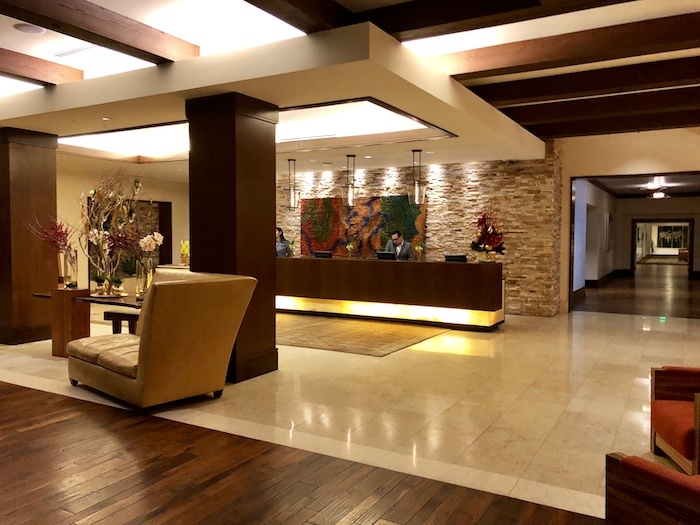 It’s surprisingly spacious for an urban hotel and is located at the edge of the Uptown Design District, less than two miles from the downtown strip. Amenities include a pool shaped like a grand piano (if you squint you can kind of see it, otherwise it looks like a misshapen yet sparkling blue blob), an upbeat pool vibe with a DJ on weekends, and cabanas accented with oversized black and white photos of the stars who made the hotel famous. Hello, Dean Martin! There is also the sleepier Chiki Pool at the back to suit all your I-need-tranquility needs. Speaking of holidays, after two nights at the Riviera I moved to Holiday House. This newly-revamped property dates back to 1951 and sits just a block away from all the action on Palm Canyon Drive (Okay, maybe there’s not that much action. It’s not LA.) Owned by the same peeps behind the rustic-meets-chic Sparrows Lodge, Holiday House is a boutique motel-style property wrapped around a large rectangular pool. It’s hard not to be seduced by the laidback street-stylish vibe of Holiday House. The garden-y grounds, complete with citrus trees and ramped up with a red poppy garden sculpture by Donald Sultan, have a read-a-book tranquility and I relished a couple of lazy hours by the pool. Unveiled in 2017, Holiday House was redone by celebrity designer Mark D. Sikes (Reese Witherspoon is a fan), and the hotel’s fresh blue-and-white colour scheme and bold modern art (think Hockney and Alex Katz) in the small lobby/bar/reception area make it hip without being overtly hipster – let’s call it ‘motel modernism’. The breezy blue and whites continued into my second-story room, making me feel as if I were staying in a Delft porcelain box (if Delft porcelain boxes had kitchen nooks, balconies and Malin+Goetz toiletries). 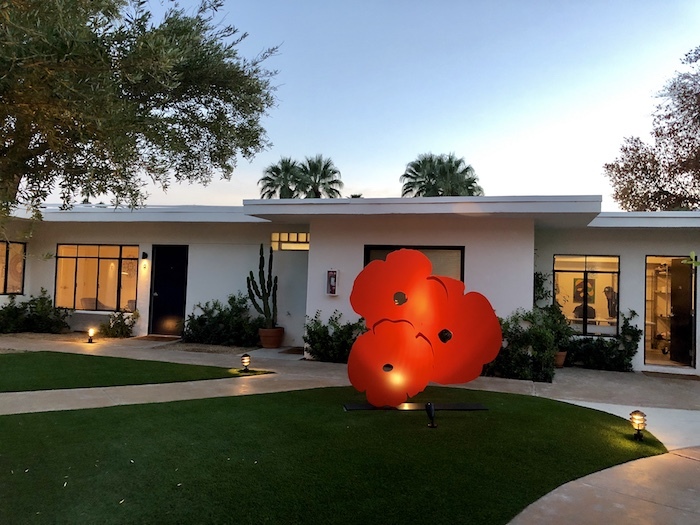 All in all I’d say this is an ideal Palm Springs getaway for travellers, especially couples, who aren’t into flash and glam or sprawling anonymous properties, but lap up contemporary culture and want to be central. Note: To foster a sociable vibe, there are no TVs in the rooms. I didn’t even notice until I heard someone else mention it – I guess I was too busy relaxing poolside. 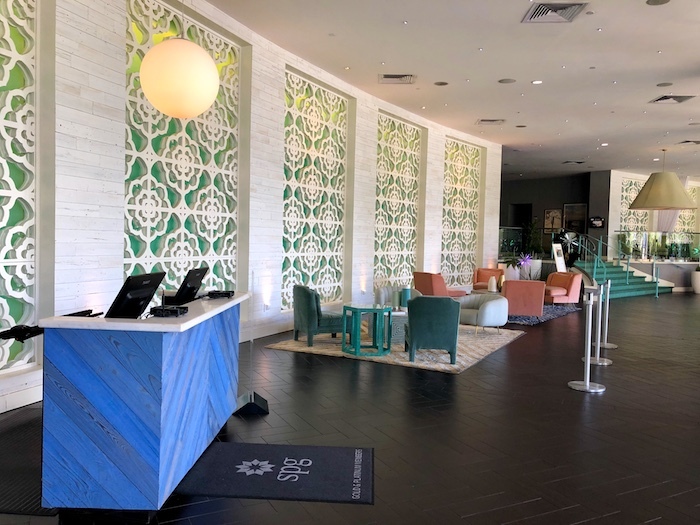 Just down the street from Holiday House is the polished new Kimpton property The Rowan, a cornerstone of Palm Springs’ $400 million downtown revitalization project. Steps off ‘The Strip’ of Palm Canyon Drive and a pebble’s toss from the Art Museum, the Kimpton Rowan reaches new heights. Literally. Seven stories high, this 153-room luxe hotel was a controversial build in low-slung Palm Springs. Whether you love it or decry it, it’s the buzziest new addition to hit PS in years. What you’ll get at The Rowan: views and more views. 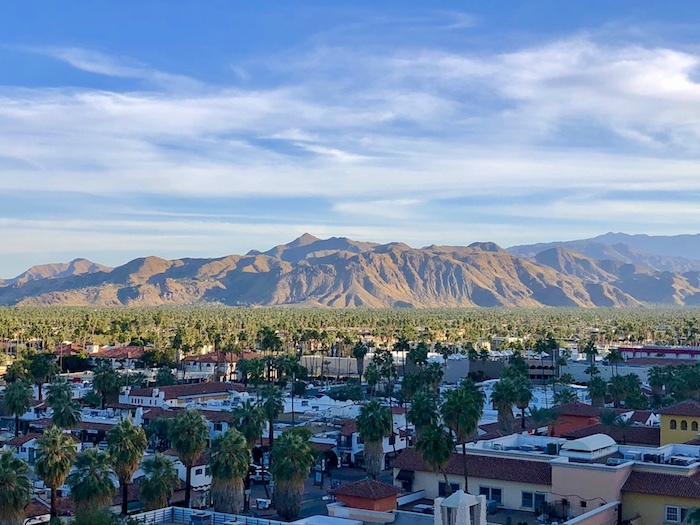 Guest room windows offer panoramas of the San Jacinto Mountains, the city and the endless desert flats. You’ll also get tasteful panache, especially in the lobby where a sky high ceiling and sophisticated decor, including a strangely-layered chaise lounge I’m infatuated with, gives a sleek edge to this very urban property. You’d think the 16-foot macramé owl would lower the tone, but it somehow blends in, adding a tongue-in-cheek nod to Palm Springs’ midcentury modern roots. I didn’t stay at The Rowan but toured around, sighed with desperate longing over the floor-to-ceiling windows in the penthouse Presidential Suite and had lunch at the Juniper Table, a casual street-level eatery that aims to elevate counter-service fare by use of premium local ingredients. 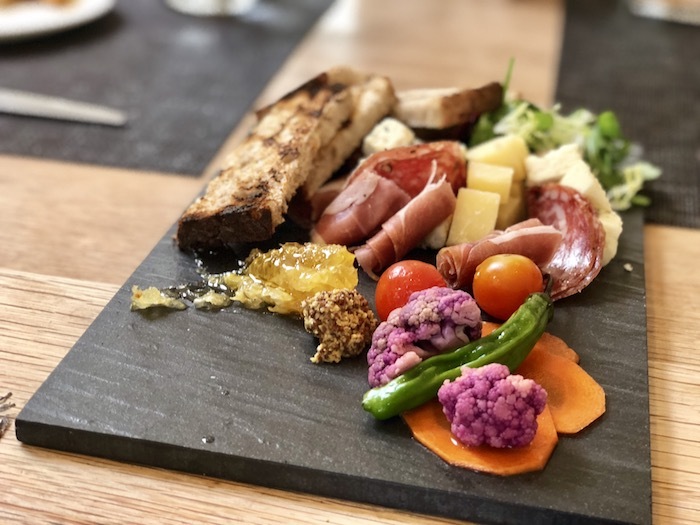 For fine dining, the hotel’s rooftop 4Saints restaurant has a menu that focuses on Mediterranean and French-inspired shareable plates. That’s not the only reason to reach for the top. 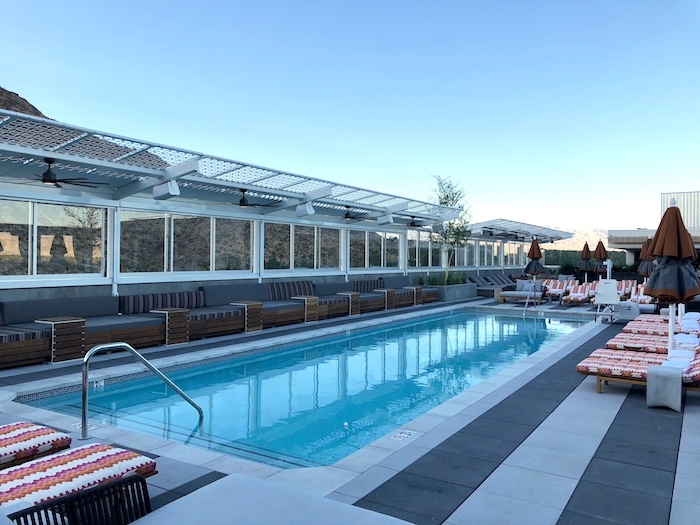 With the only rooftop pool in Palm Springs, along with six pool cabanas that can be rented out for a (hefty) fee, The Rowan is sure to be a hit with citified sophisticates. Push through the tangerine double doors of The Parker Palm Springs and enter a world of jet set glam and fabulous fun. And here’s the thing about The Parker, a pedigreed Palm Springs property (how many ‘P’ words can you fit into one sentence?) once owned by the ‘singing cowboy’ Gene Autry: If you want to have a clandestine affair and ostensibly stay on either side of the resort like Brad and Angelina were rumoured to do after filming Mr and Mrs Smith, you can do so without being bothered. Privacy is just one of the reasons celebrities still love it today. Like the Riviera, this is a So Cal (Southern California) hotel with a past. After Gene Autry sold it in 1994 it became the Givenchy Hotel & Spa, a luxury property that aimed for the grandeur of Versailles. In 1998 it was bought by Merv Griffin and renamed Merv Griffin’s Resort and Givenchy Spa. It regained a new life (and new A-list following) when it was taken over by Le Méridien and redesigned by Joseph Adler in 2004. 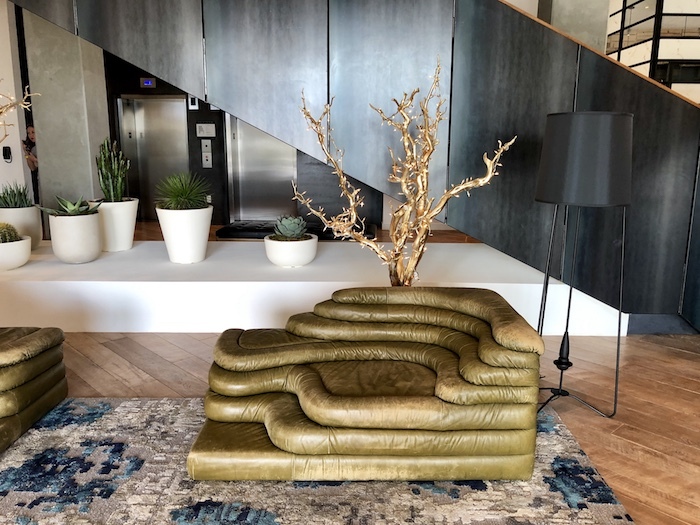 Sitting on 13 acres, a 5-mile Uber ride from downtown Palm Springs, the Parker combines wacky exuberance with elegance, no easy feat in the world of deluxe hotels. Hands down this is one of the best hotels in Palm Springs if you like artsy fun. Where else can you stroll past a vintage pharmacy sign that blares ‘Drugs’, a seven-foot bronze banana sculpture and a lemonade stand in one go? Or have Leonardo DiCaprio rent out the entire Mister Parker restaurant for himself and a handful of friends? While I wasn’t part of DiCaprio’s crew, I did spend an evening at The Parker, and as soon as I walked past the suit of armour in the lobby I was smitten. 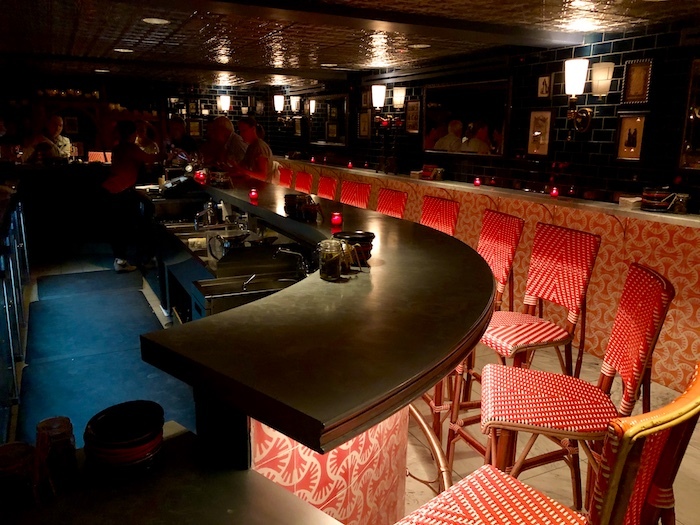 This developed into a fully-fledged hotel crush after drinking a glass of bubbly at the dark and saucy Counter Reformation, a newly-minted wine bar complete with a carved confessional imported from Italy. The Parker has two outdoor and one indoor pool, a fitness centre, tennis courts and those all important croquet lawns and boules courts. Restaurants include the more casual Norma’s and the upscale Mister Parker. If I return to Palm Springs (actually, that’s a when, not an if), the Parker would be my property of choice. Mostly I want to hang by a chlorine-free pool, swing in a hammock on my own private terrace and pretend I’m a celebrity who doesn’t want to be disturbed. What’s not to like about that? By all accounts (I asked at least two people) the Ritz-Carlton Rancho Mirage Resort is the top luxury resort in Palm Springs. This secluded getaway is perched nine miles southeast from Palm Springs up in the foothills of the Santa Rosa Mountains, and the views of the Coachella Valley are nothing less than stunning. While the Edge Steakhouse is purportedly one of the best (and most expensive) restaurants in Palm Springs with one of the most coveted views, the hotel’s State Fair Bar & Kitchen’s local ingredients, California-inspired cuisine and homemade charcuterie captured my desert-warmed heart. 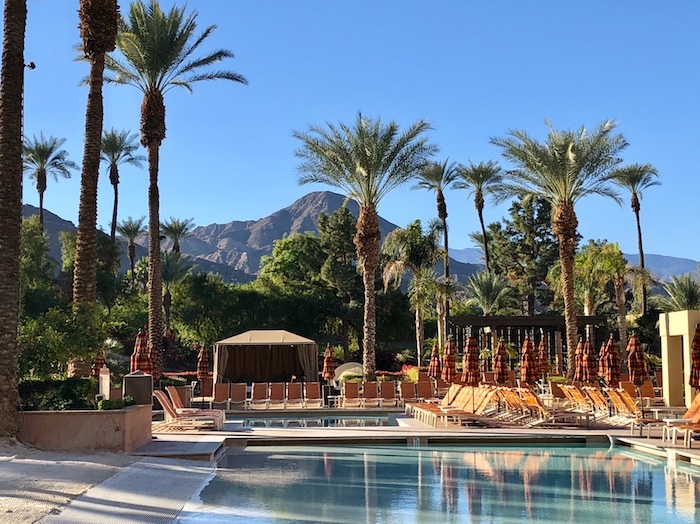 This is a resort where connecting with Palm Springs’ unique desert and mountain scenery is as simple as sitting by the fire pit and watching the distant mountains turn pink in the twilight. It’s a place to hike, dine, soak up serenity in the adults only Vista Pool and indulge in a Desert Wildfire Poultice Massage or a Sec-he Rock Ritual at the splashy two-story spa, part of a mega-bucks revamp in 2014. This 5-star resort is designed to soothe and impress, with natural tones and materials used throughout. Think stone, copper, wood and fire, lots of sand beiges and oversized windows that blur the boundaries between nature and resort. Ah, I’m salivating just thinking of it. If you’re wondering where to stay in Palm Springs that will answer your every luxurious need, look no further. Amenities include a Ritz Kids’ Club, the full service Ritz-Carlton Spa and three pools. With it’s peaceful cliffside location and 36,000 acres of space, this is a 5-star resort to breathe in – even if every breath will cost you big bucks. 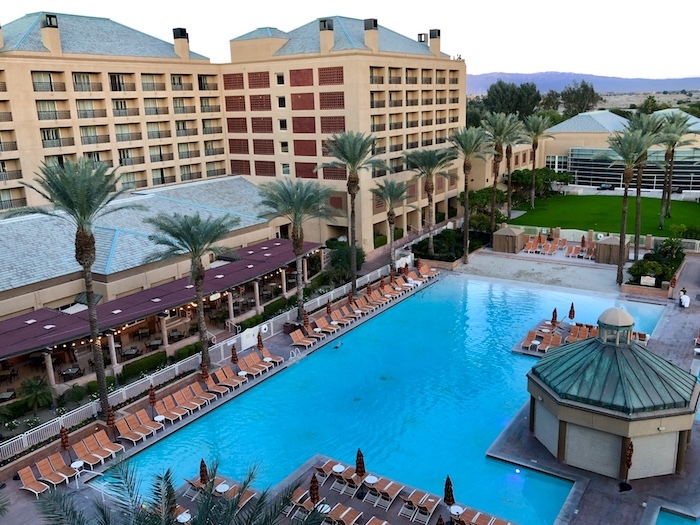 My first impression on checking into the Renaissance Indian Wells Resort is that it’s a good hotel for conventions, families and golfers, with easy access to the Indian Wells Golf Resort that rubs up against it. 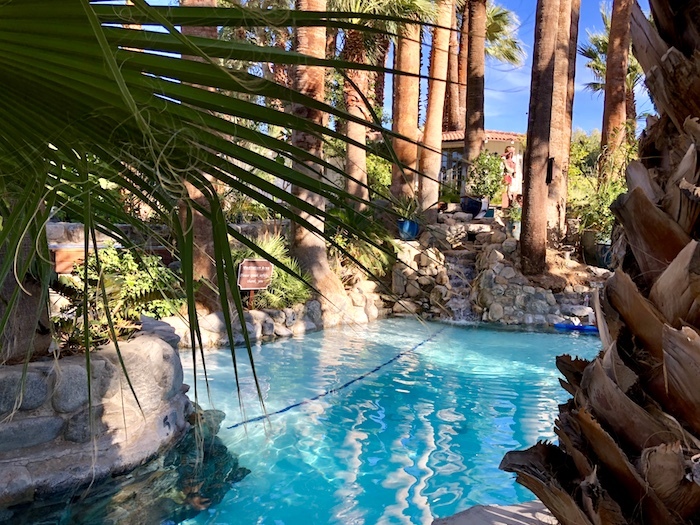 It’s also an option for people who want to combine crisp sheets and pool time with the annual Coachella Valley Music and Arts Festival, which is held in Indio 9 miles away. The pool area is where the resort-like atmosphere of the Renaissance kicks in. There is a sandy beach pool that is so child friendly it makes me want to have kids myself. There are islands for deck chairs, a floating pavilion, whirlpool and plenty of places to lounge. The bright red and orange patterned umbrellas give it a kicky burst of colour while views of the parched slopes of the Santa Rosa Mountains give it an oasis-in-the-desert feel. Hotel tip: My petite balcony overlooking the pool was a delight (so book a room with a balcony). Formerly the Esmeralda Hotel, the Renaissance Indian Wells (not to be mixed up with the Renaissance Palm Springs) is a 4-star Marriott property and amenities include the Esmeralda Spa, a Camp Oasis kid’s club, and a selection of restaurants including the Sirocco Pizza Company and CAVA (where I thought the DIY juice bar at the breakfast buffet was a nice touch). The property is about 15 miles southeast of Palm Springs city, not too far from the Living Desert Zoo & Gardens, but a good distance from the centre of Palm Springs. Ah, the memories. It was so satisfying to revisit Two Bunch Palms, one of the most unique spa resorts I’ve been to (and I’ve been to a lot). 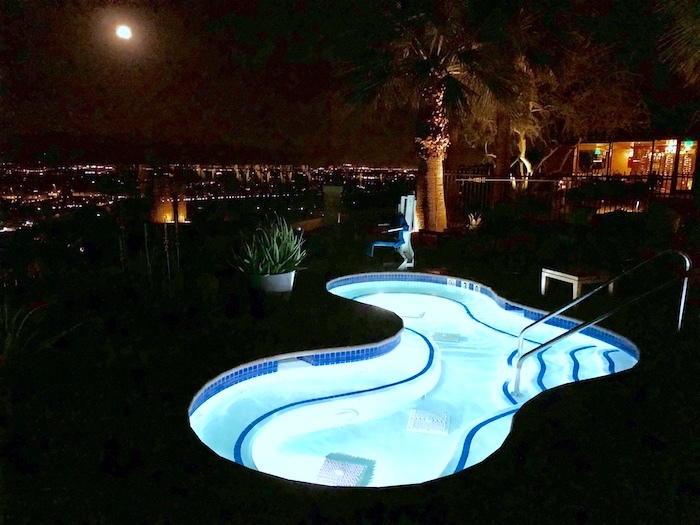 A few years ago I spent five days at this luxe property in Desert Hot Springs. My mother (who was my partner in crime) and I still talk about what a great trip it was. For one thing, this quirky-yet-sophisticated spa resort is a 70-acre property with spacious grounds studded with palms and giant tamarisk trees and populated by ducks and egrets, and there is a wide range of rooms and condos to choose from. Being able to book a two-bedroom condo with an outdoor hot tub in the backyard gave us plenty of space and privacy because no matter how much my mother swears she loves me, I’m sure she was glad to escape my sparkling company for a few hours each day. And Two Bunch Palms really was a hideout for Al Capone, who is said to have holed up here with his silent screen actress girlfriend, Gladys Walton, is irrelevant (except I think it’s relevant). And whether or not that really is a bullet hole in the bureau of his original stone cottage room from a foiled assassination attempt is up for debate (except I believe it). And if Two Bunch Palms really is going to get rid of Capone’s cottage, which currently you can rent out, I think it’s a shame. 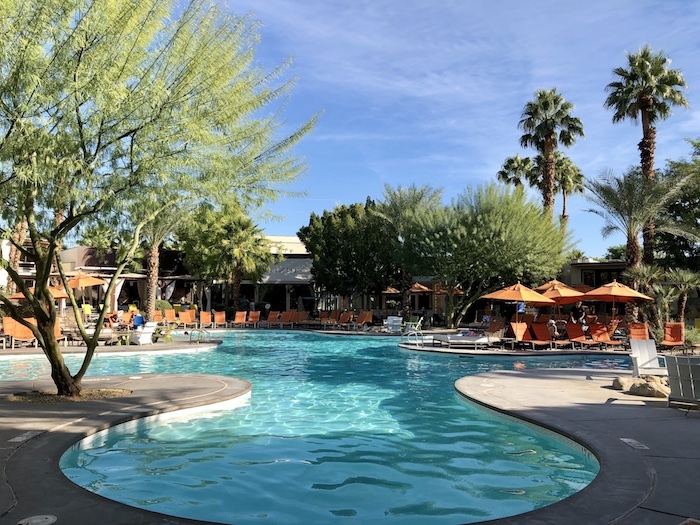 Nonetheless, Two Bunch Palms is an adults-only haven with a loyal contingent of return guests and if you’re seeking a serious spa vacation, this is one of the best places to stay in Palm Springs. As I lay soaking up lithium, one of the most exciting minerals in the water (if you get excited about spa water like I do), the woman beside me confessed she and her husband have been coming here for 20 years. I’m considering following in her footsteps. Hotel tip: This is a destination spa resort and the pools are soaking pools rather than swimming pools. Expect to relax. This dreamy Palm Springs spa resort may not want to crow about its gangster hideaway past, but it’s rightfully proud of its sustainable present – it was the first carbon neutral resort in the USA, and is completely solar powered. 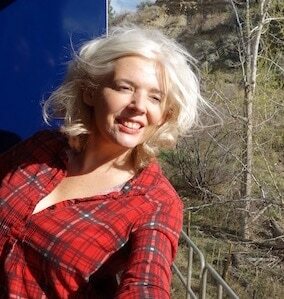 If that’s not making use of Palm Springs incessant sunshine, I don’t know what is. For Palm Springs highlights check out 15 fun things to do in Palm Springs and hiking the Palm Springs Museum Trail. For more information on where to stay in Palm Springs, visit the Official Greater Palm Springs website. Note: My stay was subsidized by the Greater Palm Springs CVB. All opinions and Palm Springs resort love are my own.